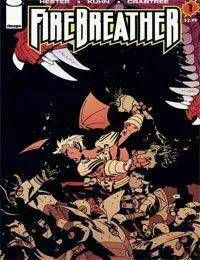 Back by popular demand, the adventures of Firebreather continue in this all-new monthly title. High school is tough enough for normal kids, but when your Dad is a city-stomping giant monster who expects you to follow in his footsteps it gets even tougher. PHIL HESTER (THE DARKNESS, The Irredeemable Ant-Man) and ANDY KUHN (Blue Beetle, Marvel Team-Up) deliver the high octane action, drama, and humor. For fans of INVINCINBLE and Ultimate Spider-Man.